"Max & Mollie"! One of my favorites, YAY! This is always her yearly Christmas present too so it works out great. Aren't her girls just adorable!! Would you like to play with "Max & Mollie" too? I'll give away one collection kit of Max & Mollie this week!! All you need to do is follow me on Instagram (if you are on Instagram, if not that's fine too) if you aren't and want to start its free, you will love it! I have so much fun and have met so many great people with the same interest as I do... crafting and dogs. Then leave me a comment, here on the blog, about what you will use this cute little paper collection for! I'll pick one winner Thursday and post it on the blog. I would use Max and Mollie for layouts of my grandsons. 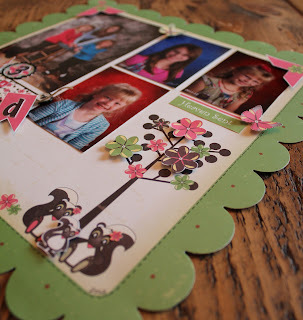 Such a cute layout - love this collection. Oh nikki.this is such a cute layout. I would live to play with max and mollie. Thanks for the chance to win it. Also, I do not have an account on instagram. I have thought about checking into it. So I might have to do that soon. Can't until after tomorrow sometime....got called for jury duty....so we will see if I get picked. When I do join then I will follow you first. I'm not on instagram. But I LOVE skunks!! I got to pet one when we were in Oregon last summer. LOVE IT. Anyway, I'd like to make a mini album of our trip to Oregon. I'm following you on Instagram now....and would use this for layouts and fun cheery cards! Super cute layout! I would definitely go with a layout of my sweet little 3yr old troublemaker. So stinkin' cute! I would use for pictures of my new baby girl due in a few weeks! SO cute! Probably nieces' birthday. Or, a camping trip? Fun to decide. 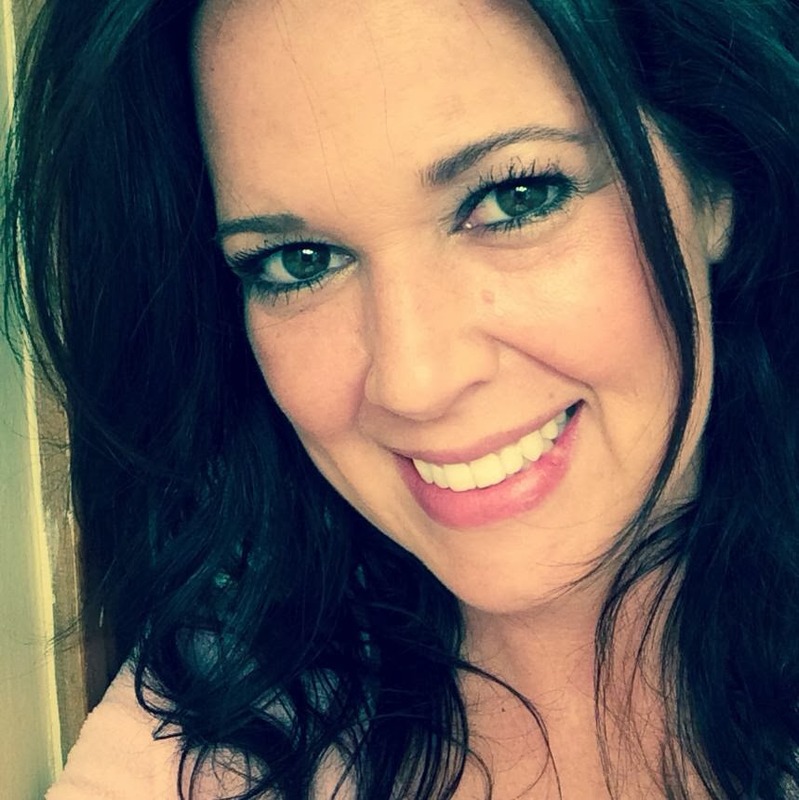 I also love your adorable layout you made your your friend and her daughters. I would also use it for my daughters and use your layout as inspiration. Thanks for the chance to win your great scaprapbooking products! This is so cute! I would love that paper & would use it on my little stinkers, oh I mean kids! LOL. I just signed up to follow you. I had no idea how many of my friends are on there! Thanks for giving the inspiration to try something new!!!! I love Max & Molly, they are just too cute. They remind me of my niece and nephew. Usually I call them birds, but I think lil stinkers is prob a better description!!! And I have lots of pic for layouts using this paper!!! I love that paper line! The pink and greenis so great together and I just love the little skunks! Since you made one boy skunk and one girl skunk I would definitely use it for pics of my son and daughter! So cute! effect for my golden retriever!! Thanks for the chance to win... great layout!! I would use the Max and Mollie collection for my daughter when she was sewing an american girl stuffed animal!! It would be perfect. What a beautiful layout! Thanks for sharing! 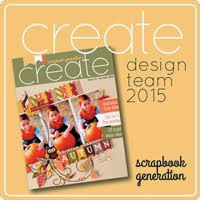 I would use this adorable collection for layouts of my two boys and my niece! Love the colors and designs! Thanks for the chance! Super super cute papers! Your collection is so hard to get in Holland. If I'd win these papers, I would go to the big pet shop around the corner to make another picture of the cute skunk they have and make a LO about him/her. I did one, years ago, about the skunk they had then. He doesn't live anymore, but the got a new one. You must see this LO (on MDF) if you want to see thissome cuteness. I really would love to make one with your papers!!! I am stalking, I mean following you on IG!!! lol!!! Thanks for all the nice comments on my IG!!!! This is such a cute layout! 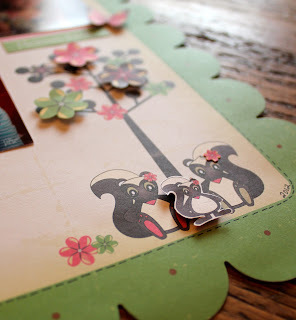 Those skunks are so adorable, I would definitely use it to scrapbook pictures of my daughter! Now a follower on Instagram! Love the skunks! I would probably use the kit on pictures of my daugher and I from one of our camping trips. Mommy and me page or mother daughter time. Thanks for the opportunity to win! Hi Nikki. I follow you on instagram and love all of your pics. You crack me up sometimes. You did a wonderful layout for your friend. I would use Max and Mollie for my kids because they are "stinkers"...lol. Thanks for the chance. I would use Max & Mollie to scrap and sahre with our daughter and have some scrappy time together! What a great layout!!! those little skunks are adorbs!! I'm not on instagram unfortunately... :( Thanks for the chance to win such a great prize! !